Can You Find All of the Hidden Animals Here? I’ll bet you couldn’t miss the giant human face island in this image. (After all, humans are animals.) But, did the giant head in the water distract you from the other hidden animals in this image? baboon face in the tall mountain in the background? profile of the monkey face on the left side? lion (?) in the mountain range? profile of a bird in the rock jutting into the water at the bottom? 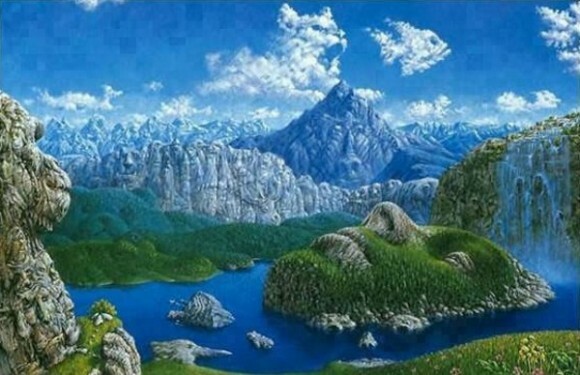 There are probably a ton more hidden animals in this illusion too. The quality of the image is a bit poor, though, making them a bit hard to see. I can see glimpses of other animals here, but I can’t really make them out. What other hidden animals can you see here? Prev These Awesome Projection Cakes Will Blow Your Mind! Teddy bear in the green mountains in front of the profile of the monkey.